Will these star heroes succeed in Politics? Will Rajinikanth and Kamal Hassan succeed in Politics? politician and actor Vijaykanth predicted that Rajinikanth and Kamal Hassan will surely fail in politics. 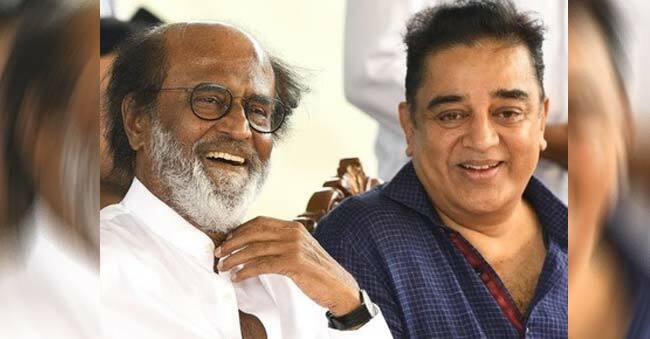 The senior politician who entered much prior to Rajini and Kamal and started ‘Desiya Murpokku Dravida Kazhagam’ shocked one and all with his statements on these star heroes. There was indeed a political vacuum, after the demise of Former Chief Minister Jayalalithaa. To fill in this emptiness both the actors have jumped into politics. They both are still to make official announcements of their party names, but the work has been started already. It is a shocker to Tamilians that they made an entry only after ‘Amma’s’ demise and have been active participants in politics. Critics say that actors like Vijaykanth and Sarath Kumar are brave enough to have entered politics when the ‘Iron Lady’ was alive. Both the heroes even took the attack to Jayalalithaa. Now, actor Vijaykanth’s main point draws us all in the same lines, questioning the courage of Rajini and Kamal. He was also harsh when he said, “Maybe they are my seniors in the film industry but they are my political juniors”. He concluded saying they both will miserably fail in politics. Nithiin presents ‘Chal Mohan Ranga’- Teaser Out! Next articleWork work and only work… makes Charmme glow!